It seems like just yesterday I bought teeny tiny broccoli plugs for 25 cents each from a farmers market vendor. They looked so small and helpless I couldn't believe they'd survive the rabbits and other predators of tender young plants. The first week I bought four plants, and they did so well in the garden that the next week I bought four more. All have survived and grown huge and one has just yielded a large head of broccoli. It may be just a broccoli plant to you, but to me it was a gardening milestone. The broccoli got planted. The broccoli survived. The broccoli will be eaten by me and not the rabbits! I was practically hysterical with glee. I couldn't decide if I should do something simple or fancy with this ultra-fresh vegetable but decided I really wanted to focus on tasting, not disguising, the broccoli. I made a simple but delicious stir fry with artichoke hearts and lemon zest adding a special punch. Since I have lemon thyme and chives growing in the garden, I added some of those herbs, too. The Ancient Harvest quinoa spaghetti that we used is gluten-free, and although we're not intolerant of gluten, this noodle has become a favorite of ours. 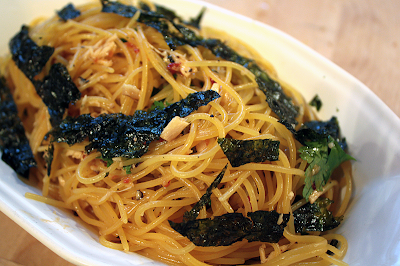 The noodles are bright yellow and have a very good texture and taste. I think the only thing in the dish that wasn't gluten-free was my husband's home-made seitan sausage, and that could easily be substituted with cashews, mushrooms or beans. First, I steamed the broccoli gently in a covered wok until almost tender. Then I removed the cover and added some oil to the wok, and added finely minced garlic to cook for a minute. Thin slices of homemade seitan sausage were stir-fried in, then artichoke hearts, shredded carrot, lemon zest and lemon thyme. The cooked veggies were placed on top of quinoa spaghetti, and crushed red pepper, fresh ground black pepper and chives were added. Garden tour (of our garden) on July 20. In my greedy little hands I have a copy of Hannah Kaminsky's newest ebook, "Á La Mode: Vegan Desserts That Will Keep You Churning All Year Round." This little gem, sent to me for review by Alisa Fleming, author of "Go Dairy Free," contains a selection of beguiling recipes for very unusual ice cream treats. These are not high-speed versions of cool confections, but require a bit of time and patience in exchange for highly unusual and scrumptious frozen delights. I was magnetically attracted to Birthday Cake Ice Cream, Buttered Popcorn Ice Cream and Chai Latte Ice Cream, but settled on the homey-sounding Oatmeal Raisin Cookie Ice Cream, because I just happened to have all the ingredients on hand, and who could refuse an oatmeal raisin cookie? Hannah gives us permission to tweak the recipes, and I did tweak a little to suit my lazy-cook ways. For example, after I ground the oats in the food processor, I went ahead and emulsified the rest of the ingredients (except the raisins, of course) in the processor rather than whisking in the pot. I didn't pre-melt the margarine (sorry, Hannah) and I added an extra cup of soymilk and an extra teaspoon of vanilla. I also added some chocolate chips just before the ice cream was finished freezing because I like my oatmeal cookies with said chips. So how did it turn out? Well, if you like oatmeal cookies and you like ice cream, you will love this. I agree with Hannah that it would go well in an ice cream sandwich, but really, it sparkles all by itself. It's luxuriantly rich and creamy (even after spending time in the freezer) as well as pleasantly crunchy from the praline and chips. If you like to experiment with unusual and intensely flavored ice cream - anyone for Peanut Butter Bomb Shell? - you should buy this book. It's gorgeously illustrated with Hannah's photos, and a bargain at only $5. Available here. There are provisions in the recipes for non-soy and gluten-free ingredients. 1. Although I ground the oats as fine as I possibly could, when I took the chilled mix from the fridge, it resembled tapioca, a mass of teeny bumps. Plus, it had a thick skin. (Was it from one of my shortcuts?) I put it back into the food processor and blended it until it was perfectly creamy, figuring that it couldn't hurt to buzz in as much air as possible anyway. The only problem with doing this was the raisins got puréed along with everything else. 2. I don't own a microwave so I cooked the syrup for the praline on the stove and it worked out fine. To save myself from cleaning two sticky containers instead of one, I added the toasted oats to the syrup instead of vice versa as in the recipe. 3. Here's a David Lebovitz post about how to make ice cream without an ice cream maker. 4. I was so anxious to eat my ice cream that I just couldn't wait for it to firm up in the freezer, hence its less than photogenic shape in the photo. Really, you should let it firm up a bit, but it's just so good that it's hard to be patient! I've been on a pizza bender lately. I'm not sure if it started with a conversation I had with my son about Peter Reinhart and grilled pizza, or with an urge to eat summer-kissed vine-ripened tomatoes baked into a pie. But I've eaten pizza on three consecutive days this week so, whatever the influence, it was a powerful one! Buffy, hoping for a little taste of something. Anyway, I mixed up my dough in a large bowl, kneading a little in the bowl because I like to do that when the dough gets hard to mix with a spoon. After rising and punching down a couple of times, I created a pizza with fresh tomatoes, cremini mushrooms, fresh basil from the garden, Follow Your Heart cheese and a little drizzled EVOO. I baked it on a hot pizza stone (using Peter Reinhart's directions), and the crust was excellent - both crispy and chewy. My only disappointment was the tomatoes. They just didn't have the rich, deep, tangy summer flavor I was after. But, overall, it was really good. A whole pan of cinnamon buns. Darn. Intending to make just three cinnamon buns with a chunk of the remaining dough, I "accidentally" ended up with a whole pan. I rolled out the dough and spread it with Earth Balance, agave, raisins and cinnamon before rolling it up, cutting it into pieces and letting it rise. Warm from the oven, tender and slightly sweet, they were so delicious. The next day I still had a bad case of pizza-on-the-brain, so I decided to make an individual pizza in a 6-inch cast iron pan in the toaster oven. This time I used grape tomatoes along with the other stuff and added a few odd scraps of field roast, and the result was fabulous. You'd think that would have been enough, but on the third day I once again made a small pizza, topped this time with some thin slices of toferky sausage. Then I took the remaining dough and shaped a loaf of bread, since clearly this was the only way to put a halt to my obsession. The loaf is fine-grained and springy, with a delicious, slightly sour flavor. Enough already. We were recently treated to a dinner at the home of Katrina, one of my husbands graduate students. The food was all wonderful (I forgot my camera, of course) but I particularly wanted to share one of the recipes - a cold noodle dish - with you. It's perfect for summer, tastes fabulous and is so easy to make. I used Ancient Harvest quinoa noodles which are made with corn flour and quinoa and are gluten-free. I had considered making this with udon noodles or whole wheat spaghetti but opted for the quinoa instead, and it was perfect. I also think buckwheat noodles would be a good choice. Katrina, who is from China and thus knows the best ingredients to use for this traditional Chinese dish, gave me a package of specially seasoned nori to use in the recipe, but I think you could use plain toasted nori as well. When she gave me the noodle recipe, Katrina told me what ingredients she used, but didn't give me any quantities, so the amounts I'm listing are what I decided to use. The finished dish tasted wonderful, but feel free to make adjustments if you disagree with my quantities. Makes two average, or three to four very small servings. We served the noodles with barbecued seitan and steamed kale. The seitan was supposed to be barbecued, but since we don't currently have a barbecue, we marinated it in sauce and pan fried it in a small amount of oil. You could also broil it. Eating raw garlic doesn't agree with my digestive system, but these noodles are so good I was willing to feel a little sick in order to eat them. Maybe next time I'll try drinking a big mug of peppermint tea with my raw garlic.